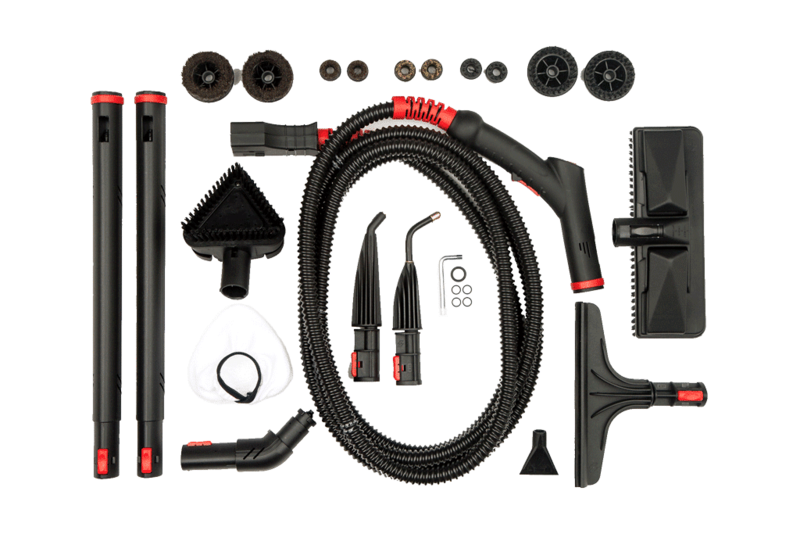 If you are looking for a heavy duty, industrial looking, and high performing steam cleaner, and you were looking at a Vapamore Forza MR-1000, we urge you to think twice. Theirs is a very good machine, but we think we compete extremely well. Anything really. And especially commercial uses. The pressure and the heat of this work-alholic will clean most anything. If you do not need and want, a continuous refill steamer, this is the one to choose. There is plenty of heat and high pressure for most commercial jobs. This steamer will get the job done and be waiting for more! We ship to the lower 48 states for $15. Hawaii and Alaska residents pay a flat $150. Have peace of mind with your purchase and a Lifetime Heater Boiler Warranty. Free upgrade to a 3 hole sprayer nozzle, 2 inch scraper, plus get a free squeegee. We also include a 3 year parts warranty. We always carry extra parts for sale as well. Have peace of mind with your purchase and a Lifetime Heater and Boiler Warranty. Free upgrade to a 3 hole sprayer nozzle, a 2 inch scraper, plus get a free squeegee. Let us make the case for our REFILL 100 machine. Feel free to call or email us if you have any questions at all. Lots of brushes- and even a water bottle! Vapamore uses an “integrated” heater within the boiler. This is what “integrated” really means and you decide what is better. To “integrate” the heater, the boiler is cut off near the top. The heater is placed inside the boiler. Then the top is welded back on and the heater is now non replaceable within the boiler. This may not seem like a big deal since they offer a lifetime warranty on the heater and the boiler. HOWEVER, their lifetime warranty states that it will not be covered due to calcium or mineral build up on the heater, boiler, or other internal components. Let’s face it, at some point there will be calcium and mineral build up inside a steam cleaner. A little corrosion as well. Its the nature of making steam.This is why we use an EXTERNAL heater and do not have a set up such as this. If a customer were to be charged for a complete boiler and heater, it could cost hundreds for a boiler and heater of this size. 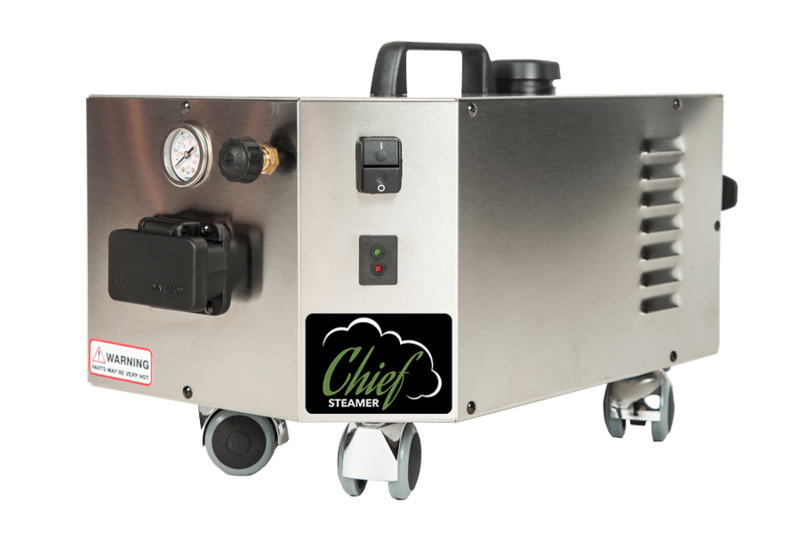 Our Chief Steamer Refill 100 uses an EXTERNAL 1750 watt heater. Sure, it’s only 50 watts more which is not much. We also feel with an external heater it radiates heat better around the boiler and heats just as fast or faster as an internal heater. And of course our heater is not ever exposed to water. And yes, we also offer a lifetime warranty on both the boiler and heater. Neither of which will fail very much. But if it happens, we will just warranty it and not claim there was too much calcium inside. If ours fails it will not be because of calcium build up, so its an unquestioned warranty. Now the size and the look of the Vapamore Forza MR-1000 compared to the Chief Refill 100 machine. The Vapamore MR-1000 is larger. It looks very heavy duty and industrial. It’s made of steel.Ours is stainless steel. No big difference in materials here. They have painted it a nice yellow and it stands out. They use very nice and large wheels. They have a big basket and nice handles. All very nice. But it’s not about size. The “look” should not be that important. We purposely make our machines a bit smaller to be used in more places more easily, like upstairs in homes. They can use a larger boiler and a large refill tank as they have a bigger body. We feel it’s not needed, but if you have the room, you may as well use bigger stuff. But it does cost them more for all the bigger stuff they use inside. But hopefully if you are comparing specs head to head, you will see that we win on most counts. And being more compact in many ways is an advantage. The quality of our accessories is exceptional. The long and heavy duty hose will hold up to hard everyday use. The brushes are a high quality that will not wear quickly. There is a very special 3 hole nozzle that most steamers do not have, and is extremely useful. A super high quality kit that many other so- called “commercial” steamer do not have. Now at 110 PSI. A modest 10 PSI increase which helps with "working" pressure. It's still not a "pressure washer" but every little bit helps. A Chief Steamer cleaner cannot run its pump more than 45 seconds without shutting down and "resting". If it senses the pump has been run too long, such as in a low water or NO water situation where it has no water to pump, it shuts off. If there is a leak and it has no water to pump, it shuts off. It will NOT burn itself out. 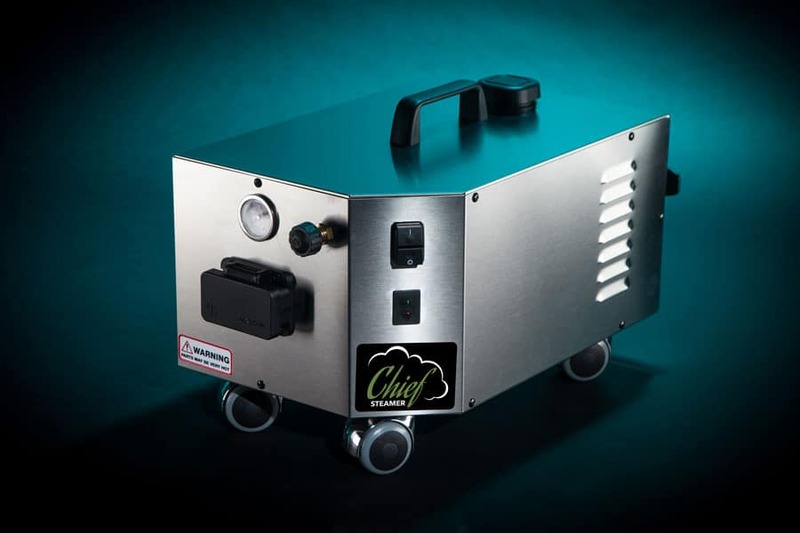 A high-quality pump is standard on all Chief Steamer commercial steam cleaners. A Chief Steamer cleaner has an "external" heat temperature sensor that is mounted on the bottom of the boiler to sense excessive temperature and turn the heater off if the temperature gets too hot. This saves the heater, the boiler, all components, and is an added safety feature.